I got this recipe in the magazine Real Simple. It was fabulous! Cook the tortellini according to the package directions. Meanwhile, heat the oil in a large skillet over medium heat. Add the onion and cook until soft, about 6 minutes. Increase heat to medium-high. Add the butter and cook until it turns golden brown, about 3 minutes. 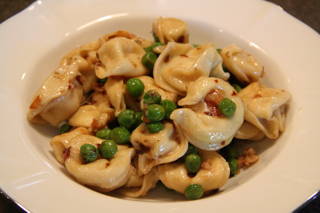 Stir in the garlic, peas, 1/2 teaspoon salt, and 1/4 teaspoon pepper and cook until heated through, 2 to 3 minutes. Add tortellini, tarragon, and half the Parmesan and toss. Divide among bowls and sprinkle with remaining Parmesan.